The partners in the FutureTDM consortium share the ambition behind the EC’s call to develop policy and legal frameworks to reduce the barriers of TDM uptake and with it, promote the awareness of TDM opportunities across Europe. “The exponential growth of data in the digital age has led to the development of powerful techniques for effectively harnessing digital information and discovering new knowledge. In this context, Text and Data Mining (TDM) enables researchers from different disciplines to analyze, extract insights and knowledge, and exploit diverse and complex datasets from various digital media. However, the present use of TDM in Europe is significantly lower than in the US and Asia, most probably due to limitations imposed by the European legal framework” (EC, CORDIS). FutureTDM is a European ongoing (2015- 2017) research project (under H2020-EU.5.f.) 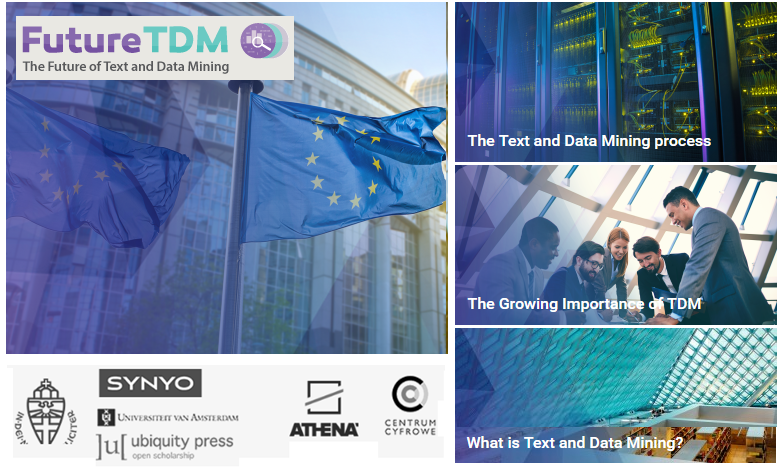 that focuses on the required identification, assessment and analysis of current Text and Data Mining (TDM) obstacles imposed by the European legal framework. FutureTDM leads to the development of novel policy frameworks and interdisciplinary case-driven practitioner guidelines to facilitate the spread of TDM activities of research environments in the exponentially growing world of machine-read material, known as Big Data using a Collaborative Knowledge and Open Information Approach. all key stakeholders via targeted stakeholder consultation to identify practices, requirements, and specific challenges in the field of TDM and installation of an advisory board and integration of practitioner groups in local and pan-European workshops. existing studies, legal regulations and policies on TDM within the European Union considering generic and domain-specific barriers and national idiosyncrasies/anomalies, and compare them with international developments. current application areas and trends in TDM including statistics and key figures, collect relevant research and industrial projects, derive best practices and provide a structured collection of relevant knowledge and information resources. - a legal and policy framework for future TDM - defines policy priorities, specifies a research agenda with future applications in mind to create interdisciplinary, case-driven practitioner guidelines to foster the spread of TDM in various research fields within the EU. - a Collaborative Knowledge Base (CKB) and an Open Information Hub (OIH) combined on a web-based platform including intuitive tools like a TDM Stakeholder Map, a TDM Expert Navigator, a European TDM Research Project Directory, or a TDM Best Practices Library. awareness of TDM to especially attract new target groups and science domains by creating a roadmap, run mobilization and engagement activities and provide information material and modern TDM Visualisations and Infographics. D4.1 European landscape of TDM applications report. and will serve as a one-stop resource for current and future TDM practitioners from various disciplines to ensure a broader uptake of TDM to boost Europe’s research and innovation capacities. The Project Consortium invites you to join the FutureTDM community, and tell your TDM story! If you have any questions related to FutureTDM, please contact FutureTDM directly.